House of Finn Juhl relaunches the 48 Series with the “Heart Shaped Backrest” together with the “Cocktail Bench” both soon available at Triode Gallery - the House of Finn Juhl in Paris - 26 rue Jacob 75006. In 1948, the Danish newspaper Politiken wrote the following review about Finn Juhl and Niels Vodder’s stand “The Study of an Art Collector”: ”… The collaboration between Vodder and Finn Juhl is not a new one. They have participated at the (Cabinetmakers’ Guild) Exhibitions with increasing success for years now. 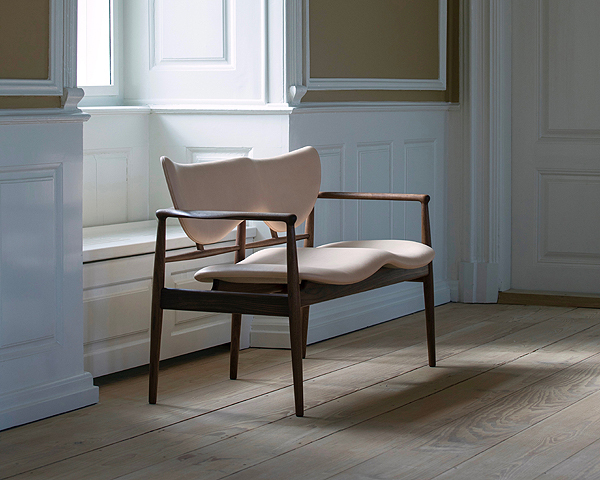 But this year they have managed to reach a new level, best classified as a new school of design.” Today, 70 years later, House of Finn Juhl has decided to relaunch the series that consists of a chair and a sofa-bench. The series has been unveiled at the furniture fair Salone del Mobile in Milan. The 48 Series – The Return to the Core of Design. When the 48 Chair and the 48 Sofa-Bench are presented at Salone del Mobile, they will be part of a setup named “The Study of an Art Collector Anno 2018″. The series will be displayed alongside some of the most classic and iconic pieces, such as the Chieftain Chair, the Poet Sofa, the Kaufmann Table and the Panel System. Just as in 1948, the study will embody any art lover’s idea of a tactile, colorful and holistic space. 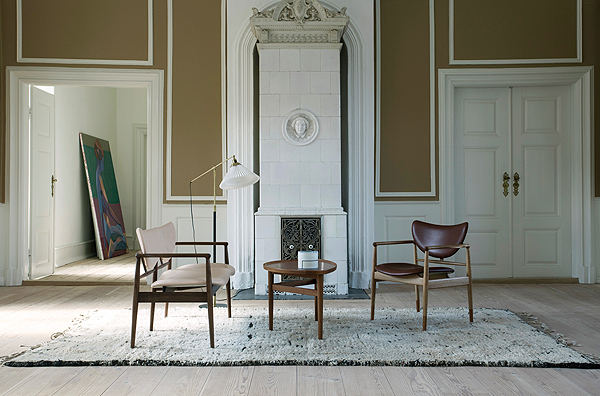 The 48 Series is easily recognizable because of Finn Juhl’s characteristic and sculptural shapes and delicate details. The chair and sofa-bench will embrace a seated person while the rounded surfaces are shaped to fit the gravity of the resting body and its proportions. The organically shaped seat and backrest, upholstered in fabric or leather, are raised from the carrying frame in an almost demonstrative manner. Visually this lifts the seated person, making it appear as if the law of gravity has been defeated. Additionally, the 48 Series is characterized by the use of multiple materials. 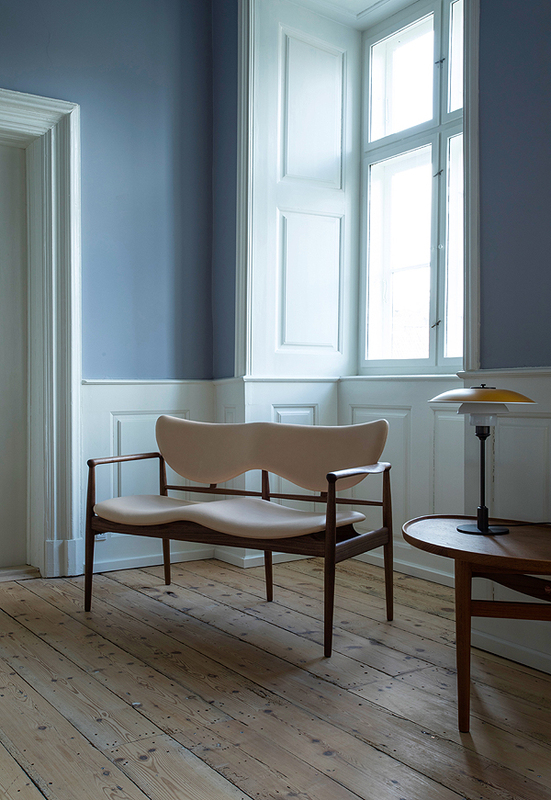 In Milan House of Finn Juhl displayed two versions. 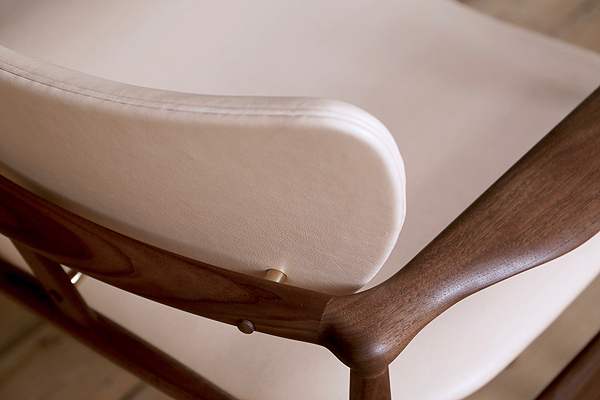 One in oak with armrests and toes in teak and a version entirely in walnut. 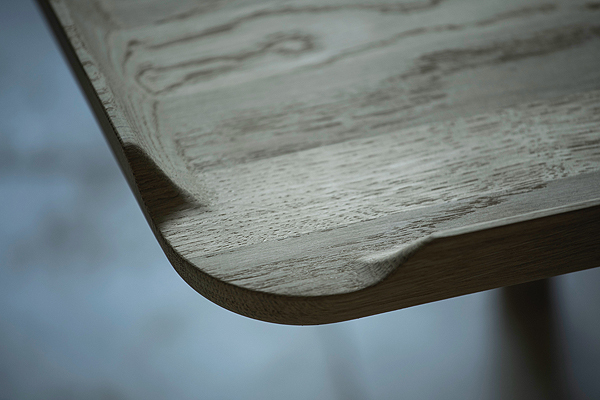 Today, it is rare to see furniture that employs two different types of wood. This type of contrast has been left almost entirely to Finn Juhl despite the many years that have passed. A Bench as a Table. 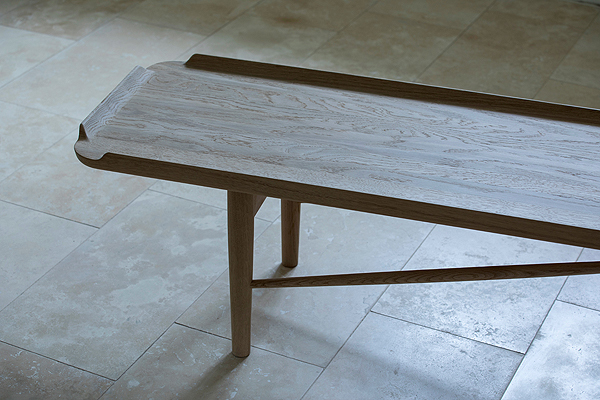 House of Finn Juhl also relaunched a bench in solid wood, which will be available in either walnut or oak. 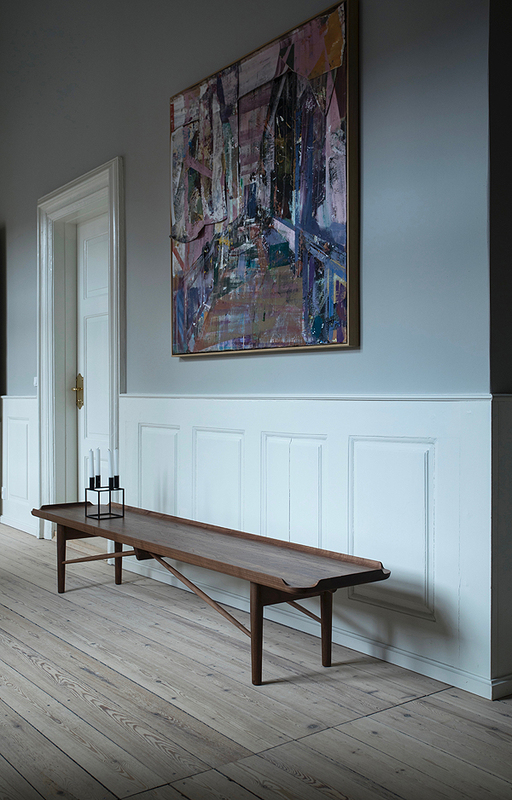 The bench can also be spotted in Finn Juhl’s own house north of Copenhagen. In 1951, Finn Juhl designed the bench for Baker Furniture in USA, who named it “Rectangular Cocktail table”. 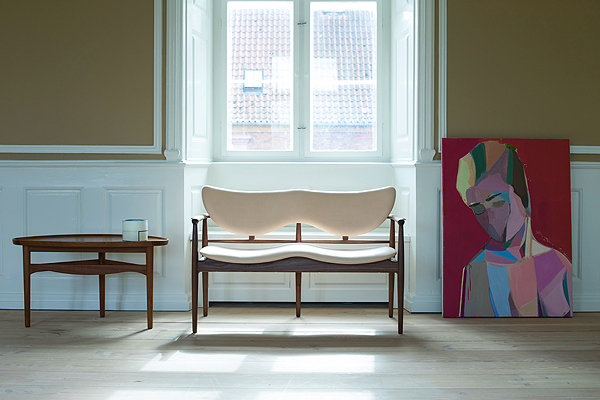 However, in the original drawing Finn Juhl referred to it simply as “bench”, which is the reason why House of Finn Juhl has decided to call it “Cocktail Bench”. The bench however, is also well suited as a table for art, a stack of books or a lamp. The Art Collector’s Study – From Shape to Entirety. Even to the modern eye it is clear that Finn Juhl’s ideas reached far into the future, when they were presented in 1948. He never let his innovative designs stand alone but rather opted for creating a so called “Gesamtkunstwerk” – a German word, which means entirety experienced and achieved through even the smallest of details. Finn Juhl’s stand at the Cabinet Maker’s Guild Exhibition was thus a fully designed work. The 1948 stand received the following praise : ”… The most original room of the entire exhibition is “A Study of an Art Collector” (…). 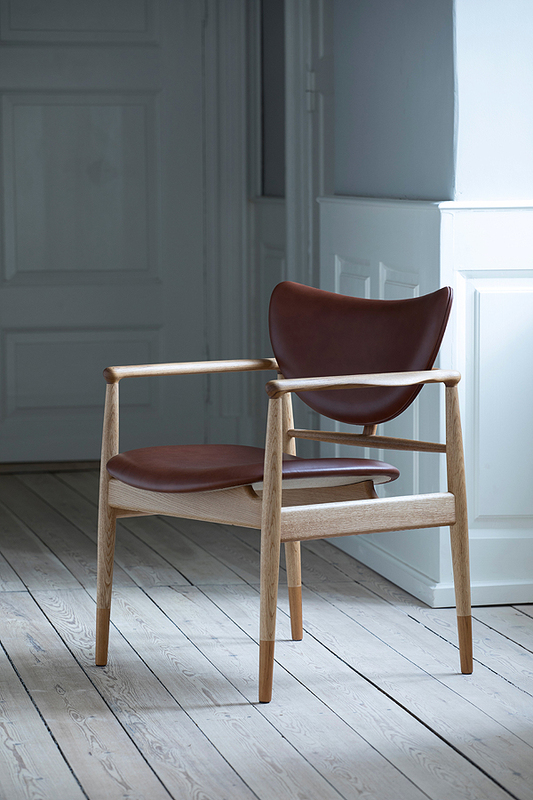 Finn Juhl is probably our most imaginative furniture designer. The art collector, who is thought to reside in this study, must be a great booklover. Shelves fill the walls, all the way to the ceiling. So, what does he do when he brings home a new Lundstrøm or Egill Jacobsen? He simply hangs the painting temporarily on the exterior of the shelves filled with all the books. Finn Juhl has done so, and as it turns out, the modern color scheme does rather well. In fact, it radiates throughout the room and satisfies the mind. With this he meant to signal that the aesthetics (…) with the clear and stringently shaped furniture is to be perceived in an entirety with the modern experimental painting…”(Nationaltidende, 1948, Jan Zibrandtsen). It is House of Finn Juhl’s finest task to ensure that Finn Juhl finds his place in the modern reality – in respect of the original legacy. Therefore, the 48 Series and the Cocktail Bench will be presented as part of a so-called “Gesamtkunstwerk” – “The Study of an Art Collector Anno 2018″, when they are presented at Salone del Mobile.